Crommelins have a new, very compact, 5.0kVA Diesel Portable Generator (HYA35M5) built by Himoinsa, designed just for you! 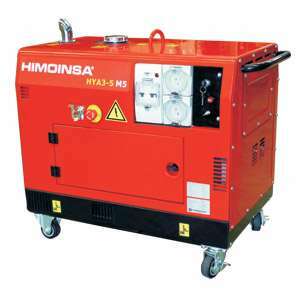 This economical, silenced, electric start, single phase generator is well suited to anywhere noise restrictions are a problem and can be transported in the back of a Ute. The large 14.5L fuel tank will provide a full day or nights work. This model is IP56 Worksafe compliant with a lockable battery isolator, emergency stop, central lifting hook, weatherproof circuit breakers & RCD’s. It comes standard with 2x weatherproof power outlets (15amp), 4x castor wheels with brakes, a silenced powder coated sound proof steel case with maintenance doors and a central lifting hook. Optional extras include full mine-spec including bunding, pneumatic wheels with brake, skid base, forklift pockets and protective bars.